Interested in a Ford Everest? Conceived and designed in Australia but built in Thailand, Ford's Everest large SUV is a dedicated seven seater aimed at bigger families, and was powered exclusively by a diesel engine when it launched in 2015. 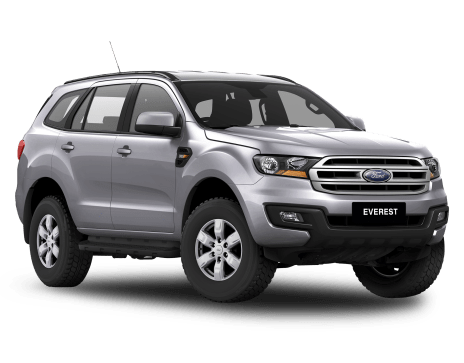 That engine, combined with a capable four-wheel drive system on its more expensive models like the $73,990 Everest TITANIUM (4WD 7 SEAT) - compared to the $49,190, rear-wheel drive Everest AMBIENTE (RWD 5 SEAT) - led to Ford declaring the Everest its most capable SUV ever, with the original Everest benchmarked against the then market leaders in off-road performance before it launched. Perhaps as a result, early iterations of the Everest were praised more for their off-road ability and three tonne towing capacity than they were for their on-road manners. This vehicle is also known as Ford Endeavour.